1.Kids keep falling out of bed? Put a pool noodle under a fitted sheet as a bumper. 2.Put pantyhose over the hose on your sweeper to locate tiny things without sucking them up. 6. Use an old tanning lotion bottle to keep your valuables in at the beach. 13. Smelly Fireplace? Crumple old newspapers and sprinkle ground coffee on top, light a fire and allow it to burn. The yummy coffee aroma will clear the sooty odor. 21.Cinnamon in the Sandbox – It keeps the bugs away! 22. Remove rust spots from knives with lemon juice. 29. Vinegar or Lemon Juice as Garbage Disposal Deodorizer Deodorize a garbage disposal. Make vinegar or lemon ice cubes and feed them down the disposal. After grinding, run cold water through the drain. 33. Soak corks in hot water for 10 minutes before cutting them for crafts–they won’t crumble. 36.Use wine bottles or soda bottles to keep your boots in shape. 38. Dandruff – pour on the vinegar ! 40. Body paint – Crisco & food coloring. Heat the Crisco in the microwave, pour in to an empty container and mix with any food color of your choice. 44.Preserving a newspaper clipping – large bottle of club soda and cup of milk of magnesia , soak for 20 min. and let dry, will last for many years! 45. Fill pot with 2″ of soil then place one uncracked raw egg in the pot. As it decomposes, it will serve as a natural fertilizer. 46.Rubber Glove as Pet Hair Remover- Put on a damp rubber dishwashing glove and run your hand over hair-covered upholstery—the hair will cling to the glove, not the sofa. 48. When you prepare vegetables save the cooking water for your plants. 51. Wine stains, pour on the Morton salt and watch it absorb into the salt. 52.To remove wax – Take a paper towel and iron it over the wax stain, it will absorb into the towel. 53. Fire Ants- Simply pour 2 cups of CLUB SODA directly in the center of the ant mound. The carbon dioxide in the water is heavier than air and displaces oxygen which suffocates the queen and the other ants. 54. Remove labels off glassware etc. rub with Peanut butter! 55. Baked on food – fill container with water, get a Bounce paper softener and the static from the Bounce towel will cause the baked on food to adhere to it. Soak overnight. Also; you can use 2 Efferdent tablets , soak overnight! 56. Crayon on the wall – Colgate toothpaste and brush it! 62. Hard water stains- To get rid of lime buildup, make a paste of 1 teaspoon vinegar and 2 tablespoons salt. Apply to sink fixtures and rub with a cloth. 64. Grease Stains – Coca Cola , it will also remove grease stains from the driveway overnight. We know it will take corrosion from car batteries! 66. To keep FRESH FLOWERS longer add 2 aspirin , or just use 7-up instead of water. 68. Use the little plastic piece that keeps your bread closed as labels for cords. Just write on it with a sharpie and clip it on. 69. Use vinegar to get rid of weeds in your yard! 72. Glue bath toy openings to prevent mold from getting inside and you from having to clean them. 77. Clean your grill with an onion. Quick, natural and effective. 78. Use salt and a paper bag to clean dust off of wreaths (and more) with nooks and crannies. 79. If you need to remove a nail, criss-cross a couple of rubber bands over the top of the hammer before using the hammer’s claw. The rubber bands will protect the surface that you’re removing the nail from. 83. Baking soda neutralizes the ph in the soil and nothing will grow there. Use it around all of the edges of flower beds to keep the grass and weeds from growing into beds. 84. Apply thin layer of polish to center of button to keep thread from coming loose. 86. Cornstarch will untangle all kinds of knots. Rub some into the knot in shoelaces, chains, string etc and watch as it comes apart. 87. Use whitening toothpaste to remove tarnish from silver. Cleans without removing all the beautiful patina. 88. Wrap a piece of Glad Press’n Seal around your wrapping paper roll to keep it from unrolling. It comes off cleanly, is reusable, and doesn’t damage the paper like tape or rubber bands. 89. For sharp, rust-free tools, store in a sand-filled bucket (or pots) with a little oil mixed in. 92. Rub a piece of wax paper along your shower curtain rod. This will make your curtain glide back and forth, no more sticking. 94. Put cupcake batter in a squirt bottle to eliminate the mess of spooning it in the cupcake wrappers. 97. How to cover a dish like an iced cake with saran wrap without it sticking- make a tent with the saran wrap and little drink umbrellas. 99. Put two TBS of vanilla extract in an oven-safe cup/bowl, then place it in the oven at 300 degrees for one hour. Within twenty minutes the whole house smells amazing. 100. Put a penny in the water to keep tulips standing tall. 104. Swipe fingernails with a vinegar soaked cotton ball before painting to make the polish stay on longer. 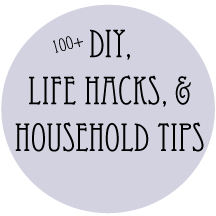 Want more DIY tips and life hacks? 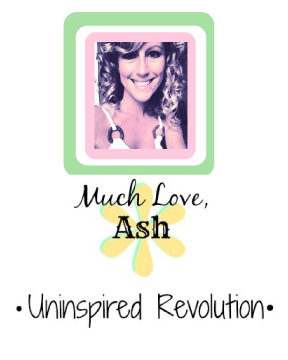 Follow me on Facebook Pinterest & Twitter! Like this post? Vote for the site by clicking the image below :) It only takes one second, seriously!! Autism Awareness April – Great Ideas!